Oliver’s letter of May 24, 1862 begins with an apology to his sister Abbie for the delay in getting a letter to her. He tells her that “last mail for this division [has] been miscarried” and that he will no longer wait to receive a letter from her, but he has determined “to write again, mail or not.” This likely explains the gap of 16 days between letters to Abbie although Oliver does mention correspondence with his brother Alonzo that seems to fall during this period. Despite Oliver’s early declaration that “there has been no particular change in the department since last report,” this is a letter filled with vivid descriptions of camp life and rumors of future operations. Blackberries are ripe in abundance and just outside the guard they are plenty but we cannot get at them but the darkies have full swing at them for they can go out and in when they please. The berries are different from those up north. They taste more like a mulberry and the vines have not near as many or as long thorns as there. The frustration at obtaining the blackberries also extends to another fruit that must have been somewhat unfamiliar to the Nutmeggers. There is quite a peach orchard just outside of camp. The fruit is about as large as a small butternut and grows quite fast. As it does in many of his letters, Oliver’s eye for the agricultural aspects of the land in which he finds himself comes through in this letter. The unkempt fields of a recently departed southern landowner do not escape comment. A key to the success of Burnside’s Expedition was to restore the railroad service to Newbern and points inland. The engineers and soldiers of the Union force worked tirelessly to rebuild the bridge across the Trent River and repair the rails to the inland of North Carolina. By the time of Oliver’s letter, a great deal of progress on these tasks has been made and rumors are flying as to the next target of Burnside’s force. The expedition has three engines put together and soon we shall have steam cars running over the rails and things will have a more business like aspect. Rumor says that any gunboats are to go to Charleston; how much truth there is to this remains to be seen. Likely coming from the newspapers that he read on a regular basis, the news from other areas of the war is much on Oliver’s mind and he passes the latest rumors along to Abbie. Rumor from James River that the Monitor had a shot put through her and the Galena was riddled and obliged to put back for repairs. Rumor that Beauregard has surrendered with 25,000 prisoners. Can’t quite see it. Oliver’s first rumor concerning the Union ironclads was basically true. 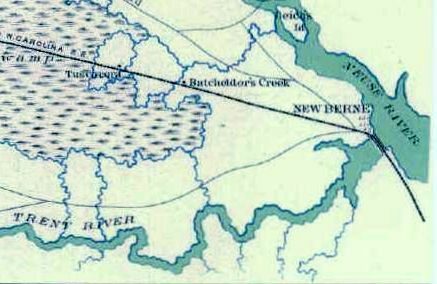 He is likely referring to the Union expedition to an area of the James River known as Drewry’s Bluff. On May 15, 1862, the now famous ironclad Monitor and the converted ironclad Galena along three other ships ventured up the James River in an attempt to threaten Richmond and support McClellan’s Peninsula Campaign. The major obstacle preventing their movement was Fort Darling, a Confederate fortification with a large number of guns perched atop Drewry’s Bluff located at a major bend in the James River. As the Union expedition approached the bluff, the Confederates opened fire from Fort Darling with serious effect. The Galena was struck twice in the captain’s attempt to turn broadside and make effective use of her guns. 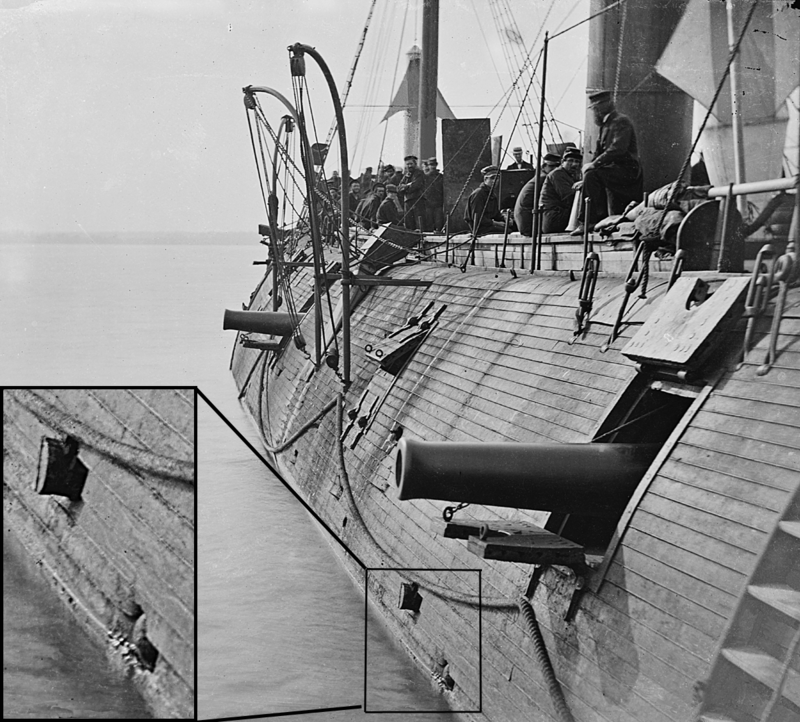 The ship was able to score a number of hits on the Confederate guns with severe result. However, the Galena was soon overwhelmed by the fire from the bluff. The ship was struck numerous times killing 12 of the crew and wounding 15 others. The Monitor was largely ineffective during the action due to the restricted elevation of her guns and the flotilla soon retreated down the river to safety. Historically, this action is notable for the heroic struggle of the crew which resulted in the Medal of Honor being awarded to sailors Charles Kenyon and Jeremiah Regan plus Corporal John F. Mackie, the first Marine in United States history to receive the decoration. Oliver’s skepticism on the second of his rumors is well founded. Confederate General P. G. T. Beauregard did not surrender with 25,000 soldiers although he did make several critical errors in judgment during the recent Battle of Shiloh. Beauregard lost the bloody battle to Union General Ulysses S. Grant in April of 1862 and was subsequently relieved of command and transferred back east. This may have led to some of the rumors that Oliver read in the papers.